In Kerava, Finland, almost 20 miles outside Helsinki, artist OLEK strung together an impressive statement. As part of an installation on refugee displacement, the Polish native completely crocheted over an art gallery that is based in a house built in the 1910s—covering everything from the chimney down to the ground with pink, patterned fabric. 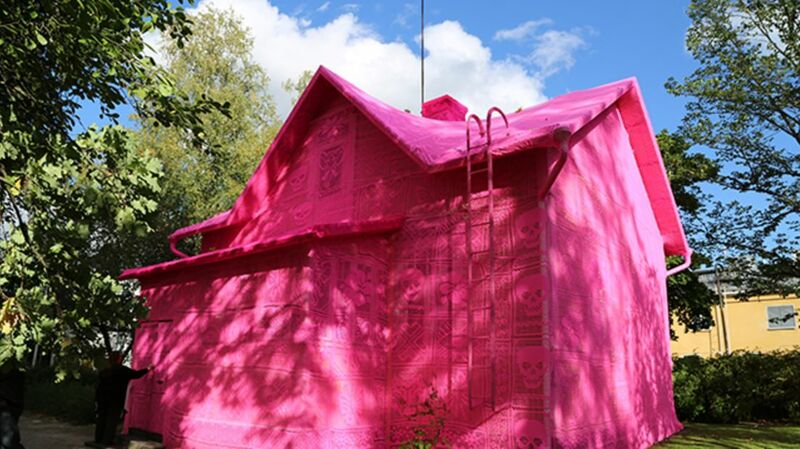 OLEK, whose work often focuses on feminism and sexuality, created the house-slipcover as part of an installation for the Kerava Art Museum in Finland. Earlier this summer, she worked with refugee women from Syria and Ukraine in Avesta, Sweden in order to create her first crochet house. Then, the artist destroyed a yarn-bombed interior room with an explosion to highlight the plight of those who have lost their homes in war. The Kerava installation is part two of the project, meant to provide a happier ending to the darker initial project. Over the course of three weeks, volunteers, including immigrants and women from a reception center for asylum seekers, helped OLEK and her team make enough pink, crocheted fabric to cover the entire building. In total, they crafted more than 3200 square feet of crocheted pattern. For even more photos, check out #ourpinkhouse on Instagram.